Hello. My name is Jason. I live in North Carolina. I am 14 years old and I am in the 7th grade. 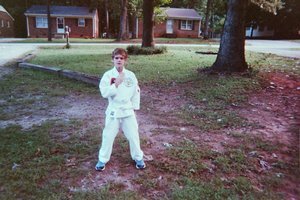 I have been taking karate for a 2 years now. I am a now a red belt. I love learning how to protect myself. Some of my favorite things to do is play skateboarding and rollerblading. I love going to parties too. I also play soccer for my middle school's team. On Dec. 2nd, 2000 we had a tournament. I won 1st place in sparring, 3rd place in kata and also a good sportsmanship trophy. Below is a picture taken during my kata. The picture below is of Grand Master Shackleford presenting me with the good sprotsmanship trophy. In January, 2002 we went to a seminar with the great Royce Gracie. In May, 2002 we had a Jiu-Jitsu seminar at our dojo with the great Royce Gracie. In October 2002, I earned my yellow belt in Jiu-Jitsu. Below is a picture of me rolling with Royce Gracie. Below is a picture of my friend Greg and I clowning around with Royce Gracie. In January, 2003 we had a Jiu-Jitsu tournament in Charlotte, NC. It was called the Dale Jr. Grappling Classic. I won 2nd place in my division. 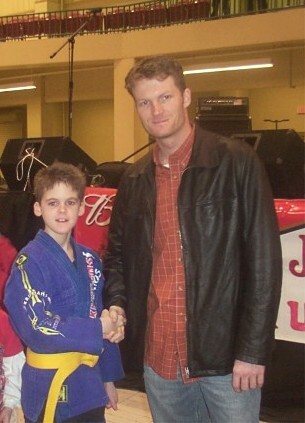 Below is a picture of me with Dale Earnhardt Jr..